Sachen Foundation officially awarded grants to five recipients for the 2019 term: Sakya Centre Education Department, Sakya Academy, Sakya Nunnery, Sakya Kalimpong Monastery, and Melody of Dharma magazine. Our inaugural grant cycle began in September 2018 with letters inviting a small group of organizations to apply for a 2019 grant. The grant recipients are clearly aligned with our vision to transform lives and communities through Buddhist education and publication. 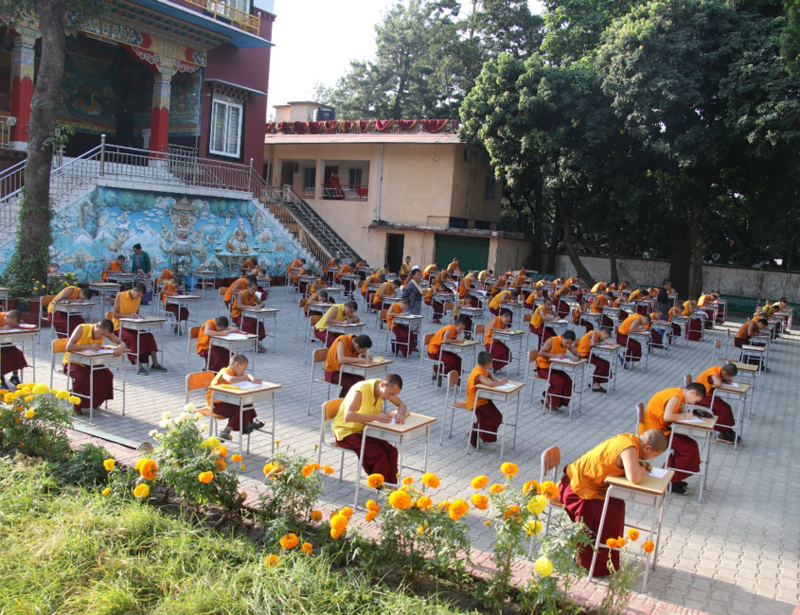 Half-yearly exam at Sakya Centre, Dehradun. Following the 1959 political turmoil in Tibet, Sakya Centre was established in 1964 by His Holiness Sakya Trichen in Dehradun, India, to continue as the main monastic institute preserving the Sakya Order of Tibetan Buddhism. In its early years, Sakya Centre endured many challenges and difficulties. The monks lived in tents, which not only served as their living quarters, but also the prayer hall, dining area, etc. Even under such meager living conditions, it was not possible to keep Sakya Centre running after some time due to financial hardship. The monks had to leave the provisional establishment. However, under the guidance of His Holiness Sakya Trichen, Sakya Centre was able to resume operating out of an old rented bungalow at 187 Rajpur Road in Dehradun, and the monks once again returned. But to truly fulfill Sakya Centre’s mission and establish a seat for the Sakya Order, funding had to be secured from various aid agencies, individual donors, and even His Holiness the Dalai Lama, to purchase the bungalow and its surrounding land. Today, Sakya Centre has five other organizations under its administrative oversight, including Sakya Academy and Sakya Nunnery, both of which are also Sachen Foundation grant recipients in 2019. The other organizations are Sakya Hospital, Sakya Institute, and Sakya Retreat Facility. The 2019 grant from Sachen Foundation will directly support Sakya Centre’s Education Department in its mission to provide a Sakya monastic education to its students regardless of their caste, creed, or color. Currently, 120 monks ranging in age from 7 to 25 years, reside at the Centre, with the majority of them originally from Nepal, Bhutan, and Mongolia. 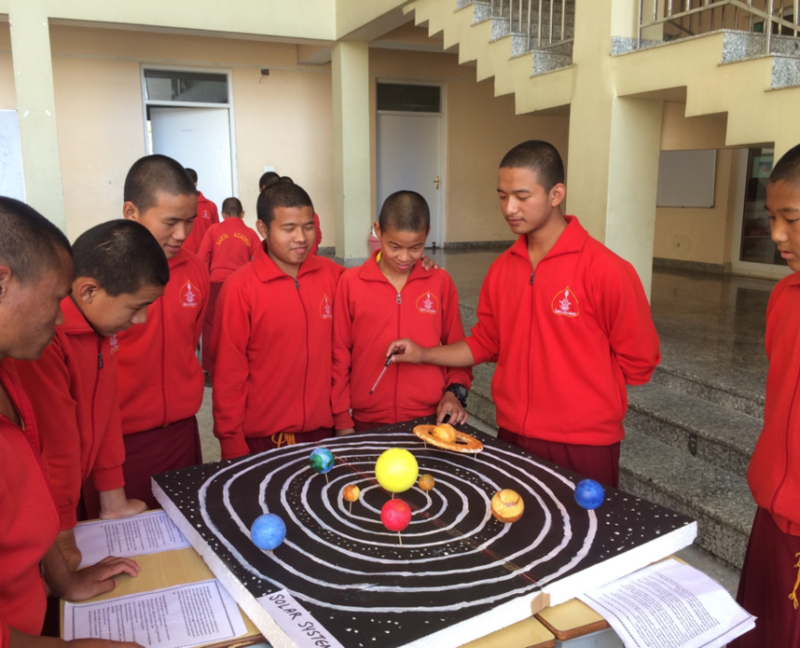 Sakya Centre’s curriculum is based on the traditional monastic educational system mirroring that of the monasteries in Tibet. At present, the Centre employs 15 instructors who teach basic Buddhist philosophy, rituals, ritual music and dance, art, and other related subjects. After completing their studies at Sakya Centre, monks can attend either Sakya College or Sakya Institute (in Puruwala) to further their education in Buddhist Studies. Sakya Academy senior students presenting their science projects. His Eminence Gyana Vajra Rinpoche’s long-standing vision, to create an institution that provided a modern, academic education merged with the Sakya monastic tradition, was finally realized in April 2016 when Sakya Academy opened its doors to students. Located on a quiet hillside about 12 kilometers from Dehradun, the Academy follows the Indian standard curriculum, including classes on math, social sciences, Tibetan, English, and Hindi, among others. There are also daily classes on traditional Buddhist scripture and prayer recitations. Furthermore, extracurricular activities are an important part of the daily program, such as organized team sports, workshops in art, music and dance, yoga, ritual practice, and meditation. Alongside a religious and academic education, the prevailing ethos is that of helping others. The Academy’s intent is to instill students with skills and knowledge learned at Sakya Academy so that they can eventually give back to the monastic and lay communities at large. The 2019 Sachen Foundation grant will support a portion of the education for approximately 190 young monks, from 5 to 18 years of age. All of them originally came from poor families in remote villages of India and predominantly Nepal, where their families fell victim to the devastating earthquake in 2015. Many would not have had access to education and healthcare, and be destined to a life of subsistence farming, struggling to help feed their families. 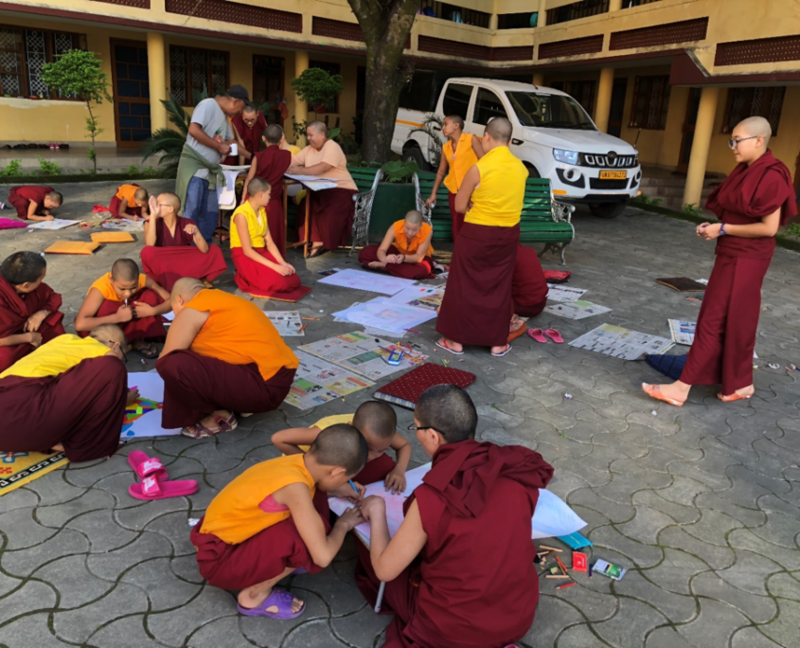 Some of the older children transferred from Sakya Centre in Dehradun, where they had an entirely monastic education, emphasizing the memorization of scriptures and only very basic schooling in other subjects like Tibetan, Hindi, English, and math. The newer arrivals, on the other hand, had little or no education at all, and most of them had to be taught how to read and write. Drawing class for young nuns, Sakya Rinchen Choling. In response to an influx of Sakya nuns into India in the early 1990s, His Eminence Luding Khenchen Rinpoche offered a parcel of land within the Dekyiling Tibetan settlement in Dehradun to His Holiness Sakya Trichen to start a nunnery. Proper facilities to support the nuns had to be constructed from the ground up. In 1997, the main Sakya Nunnery, called Sakya Rinchen Choling, was officially established. Over the years, Sakya Rinchen Choling expanded to include a main temple and additional dormitories. It now has two other nunneries under its administration: Sakya Thrinley Choling, for young nuns in Leh-Ladakh, India, and Vajrayogini Meditation Centre for nuns in Kathmandu, Nepal. The grant from Sachen Foundation will be used to support a portion of the 2019 education expenses for 40 nuns currently living at Sakya Rinchen Choling. The nuns range in age from 5 to 40 years old, and generally come from impoverished families with no means of supporting their children’s education. At Sakya Nunnery, the nuns lead a disciplined life of study, contemplation, and work as practice. They begin the day early in the morning by performing the Tara puja, then continue with the learning of Buddhist rituals, scriptures, English, Hindi, and Tibetan. Besides performing pujas during auspicious dates each month, the mainstay of the nuns’ activities is the accumulation of 100,000 recitations of the Twenty-one Praises to Tara. This occurs a few times a year and takes several consecutive days of intensive recitations. With this Sachen Foundation grant, the nuns can continue with their lifelong devotion to the Buddha Dharma, to ensure that the Buddha Dharma continues to remain with us for many generations to come.